I hope you have a great end to 2012 and a prosperous and healthy 2013!! About 3-4 weeks ago on a Saturday, a red Escalade pulling a trailer with a few rows of firewood and I believe a gray Audi left the grounds with firewood. I was out on the course and saw the vehicles leaving the property through the back gate. I've waited a few weeks to be contacted and have not heard from anyone regarding the firewood. I would like to bill the individual for the wood but do not know who was in the vehicles. Please contact me through email or call me so I can bill you for the wood. Joe WachterMerry Christmas from Lady Bug and the grounds staff. Joe WachterThe course had a couple of issues with the high winds from Thursday. An arm snapped off a silver maple that was near the left corner of #3 red tee. The tree on the left is next to 12 green. 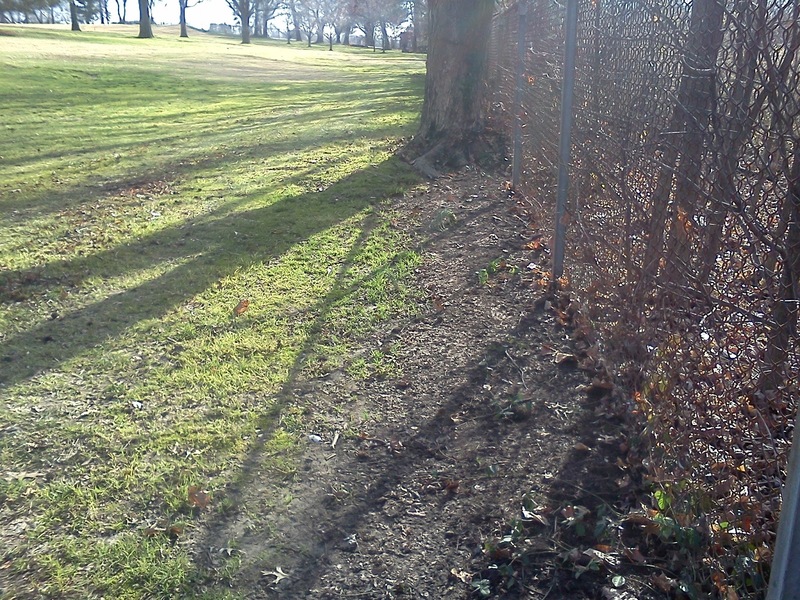 We also lost a smaller evergreen that was going to be removed this winter because it was thinning severely. We will be spending a lot of time picking up brush/twigs that fell as well over the next couple of weeks with the holidays and vacations tied together. As the leaves drop each fall, we spend a great deal of time and energy either picking them up with our sweeper or blowing them in windrows. 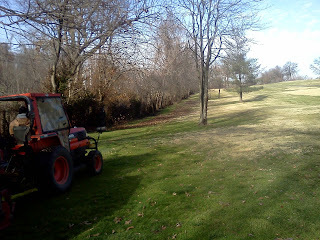 Our large area mowers then proceed to mulch them back to the soil. Sometimes the prevailing winds and or our blowing machines move them up against the fence lines that mark the edge of our course creating places for errant or in my case perfectly lined up golf balls to come to rest. We attempt to run our mulching mowers up against the fence but in the end, we must use backpack blowers to move the leaves away from the fence for removal. The staff spent most of the day today cleaning up along a few different fences including #2 and #3 and possibly on to #4. The excess leaves also do kill grass up to 3-4' away from the fence which creates difficult lies if your ball ends up in this area. Also, the leaves can blow back out into main play areas creating additional difficulty in locating golf balls. Leaves being blown away from the fence and the sweeper then cleans them up. 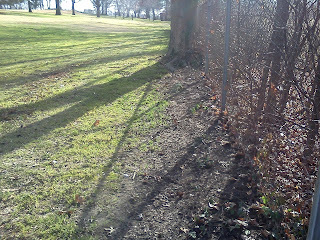 The clean fence row along #2. Check out the article below regarding the U.S. Open at Merion GC for the 2013 and the sacrifice members are making to provide for perfect conditions. 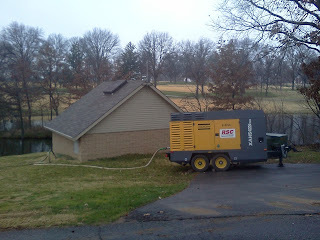 The staff spent Monday blowing out the system in preparation for winter. 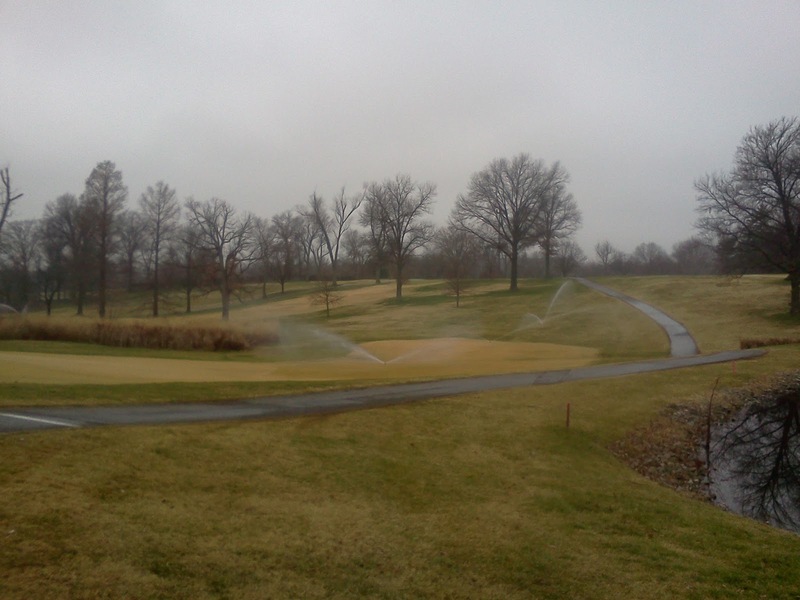 This normally takes place by the first week of December but was delayed because of the mild weather and the new sod that had been laid in late fall for the bunker project. Adequate amounts of rain over the last couple of weeks and the potential for some colder weather signaled it was time to shutdown the system. We rent a large air compressor that hooks into the irrigation system and forces a volume(900 cubic feet per minute) of air through the system while the staff turns on the sprinkler heads and allows the water to evacuate from the system until air blows out of the head. The staff are able to turn on 10-12 heads throughout the property at a time for this process. 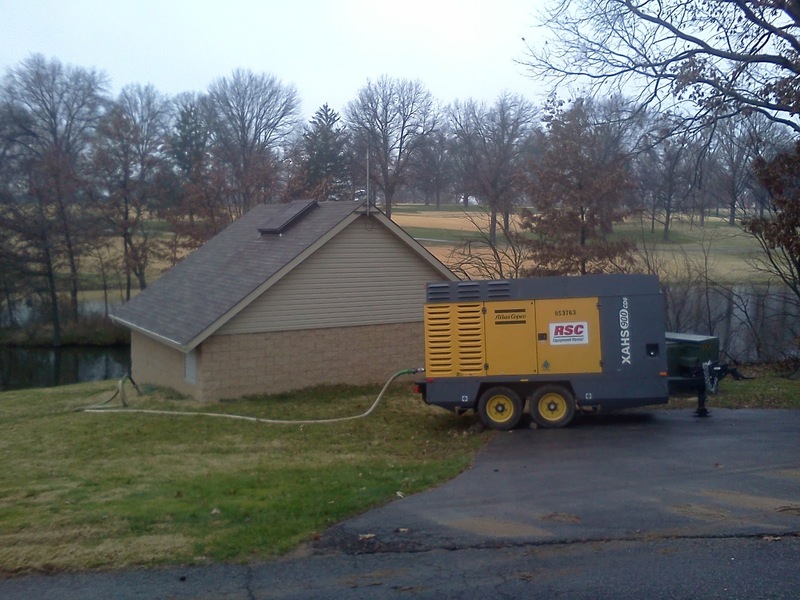 900 cfm compressor hooked into the main line at the pumphouse. Heads on #13 purging water from the irrigation lines. The blog will be on vacation for the next week. 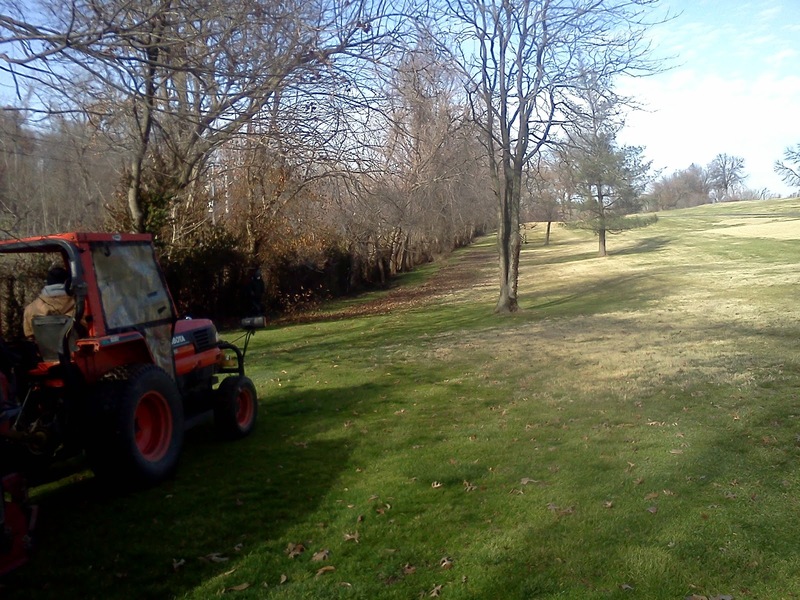 Upcoming work includes some additional leaf cleanup, removing damaged collars and replacing with good bentgrass, cleanup around new bunker areas, removal of small bentgrass approach on #2 and converting to zoysia and fertilization of all the cool season rough. Reminder, firewood is being sold to membership for self service p/u or delivery. Please alert me if you are picking up wood so I can charge your account. $50 for p/u load. Reduced charge for smaller loads. Delivery will be an upcharge based on distance.